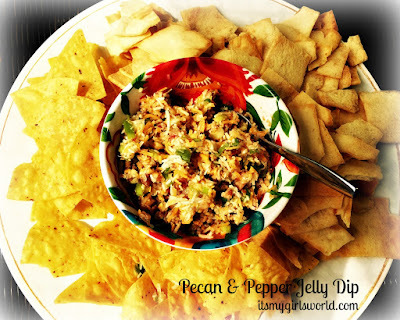 My friend Jenn made this pepper jelly pecan dip for A's party in July and I went a little crazy for it. It's so delicious, has great texture and is super simple to whip together. Since then, I've made it three times so far trying different variations. My guests finish it like it's their job and I've gotten tons of requests for the recipe. I serve with either tortilla or plain crisp pita chips. This is a great make ahead recipe from the day before. It is so, so good! It's become one of my go-to's. Try making it someday. You will NOT be disappointed. Thanks sweet Jenn! And Jackie. My life isn't the same since discovering this dip. So I make my own pepper jelly and have quite the stash on hand. You can guarantee I will be trying this during the holiday season. Thank you so much for sharing! This sounds SO delicious!!!! Yum! Thanks for sharing! Sounds delicious! I wish I could find pepper jelly around here but I always stock up when I go home.